Did you know that what Muhammad produced in the Koran, is simply a book of gibberish consisting of later evil verses abrogating earlier peaceful verses? This abrogation is explained very clearly in Peter and Tommy's book. Basically, however interpreted, the book illustrates that the standard view on Koranic abrogation concerning war and peace verses is that when Muslims are weak and in a minority position, they should preach and behave according to the ethos of the Meccan verses (peace and tolerance); but when strong, they should go on the offensive on the basis of what is commanded in the Medina verses (war and conquest). 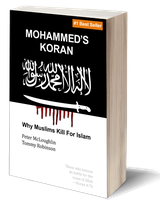 There is so much in "Mohammed's Koran: Why Muslims Kill For Islam" that is not generally known, that is truly shocking. And for some mysterious reason, it is long overdue that the Koran is subjected to the same historical scrutiny that has been applied to the holy books of Judaism and Christianity.